Our work occasionally gives us the chance to delve into social situations and needs to which our client companies wish to respond. Such as knowing the clear injustice of the cost of someone’s shopping tripling automatically and permanently simply because they suffer from celiac intolerance. The initiative of making the products for this increasingly numerous group cease to be like strange flowers, that can only be found at the price of gold in select garden centres, is therefore laudable. To change this state of affairs it is crucial that the large brands and their star products - in this case San Miguel beer - promote their “gluten free” adaptations. It is a decision which puts these products within everyone’s reach, due both to the capability of giving them massive distribution and by fixing an affordable price that corresponds to an everyday high-consumption product like beer. As is to be expected, the beer which celiac disease sufferers wish to enjoy is a real San Miguel. Therefore in the first place, the key was to guarantee gluten-free production that maintains the organoleptic qualities of the product we all know. 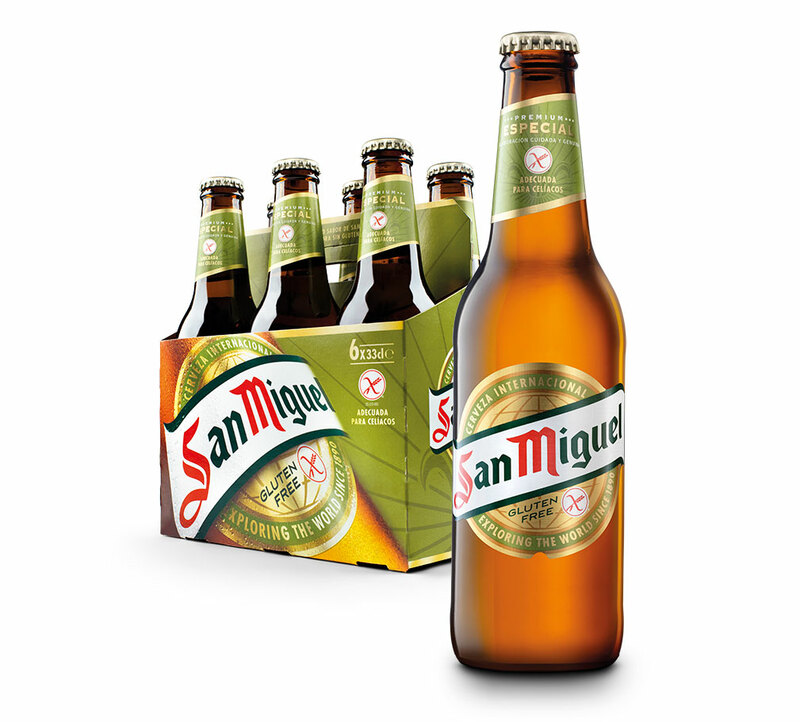 We then went on to the design challenge: the bottles of “gluten-free” beer on the shelves had to be unmistakably San Miguel but at the same time perfectly distinguishable from the regular San Miguel beer. To be effective, as well as the “gluten-free” mention and the official symbol certifying the fact, the new product was associated with a specific light green colour tone, widely present on the labels of the bottles and the design of the basket that groups them together.